Product DetailsDelivery Knife Care Which Knife? Who needs a magimix when you have Japanese steel in your hands? White paper shirogami steel, wrapped in a softer jigane steel, with octagonal handles. 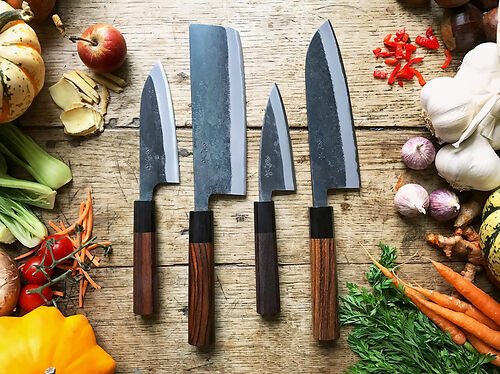 Beautifully balanced and beautifully simple Japanese kitchen knives with white paper steel blades - a popular choice for Japanese chefs, as it sharpens quickly and easily so is perfect not just for regular sharpening, but also for beginners. Get these for their weight and feel, if you're after a truly Japanese experience. The blades are carbon steel (both the inner and outer layers) and will oxidize and rust if not looked after - clean, dry thoroughly, and wipe with a little Camellia Oil if not used daily. *NB. We're changing to Japanese Walnut for the handles - currently the Santoku and Mini Santoku are Walnut, while the Nakiri and Ajikiri are still in Rosewood. Niwaki Tip: Hand wash and dry well - regular use is the best form of care!